Some days ago I was out running in mountains I have just visited wintertime before. The area has exciting ridges and not really so many trails to follow. The first couple of hundred meters there was a small trail but then to continue to the ridge and the summit I wanted to go to I had to find a way during dense mountain birch forest. It lasted around 150 meters of altitude, not much but the time it took me to nestle myself through the dense small forest became surprisingly long. Soo finally some convenient ridge running, or to be honest, it was more scrambling than running. No easy trail here ay. The uphill was great. Slow and rout finding is words that can describe it. So to the downhill! I chosed another way down, straight to where I had parked my car. I was hungry and wanted to come down as fast as possible. So the straight line from the summit to the car was a couloir. Steep and wet. I decided to find another way. I climbed out from it and followed another logic way. I thought. It took me to some cliffs. I turned around. Gaah. I know that the way I took up is possible to go down, but as most of the times when you have decided to find another way it´s hard to take the decision to go back the way you came. I was almost down by the car when I came to another steep part, and I was tired and hungry, I didn´t have in mind to do as long run as it became. So I just sat down and rested a while. I started to think a little about this route finding down this familiar mountain. It has similarities with the route finding we need to do in our lives. We have a side of us that want to explore and try new ways but sometimes it´s just as good to go back the way we came. Sometimes we find new ways that become familiar and sometimes we bring the experience with us back the way we came. I sat by the cliffs dangling with my feet just a few hundred of meters altitude between me and my car that would take me home. I putted away my tiredness and hungriness and I saw a way down! It included some downclimbing in a tree and bushwracking through dense bushes, but it was possible. 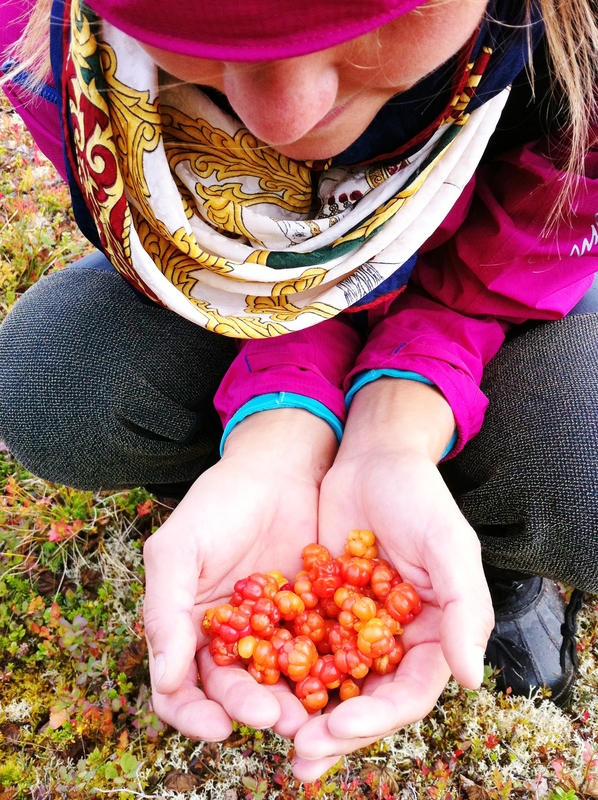 And when I finally came out on the open field I found plenty of cloudberries. Previous PostFin artikel i the guardian! Emelie, my brother and I have started trail running this year here in Calgary. You inspire us! One day, you should pack your bag to come to run in our mountains in Canada. Our families will feed and house you! Great story! That’s what life is about!